Butter chicken has become increasingly popular in Indian restaurant cuisine. The name given to imply silky as butter; and this is where it all began. !! More popular in the West it has earned a reputation. Probably the most commonly known Indian dish it now appears on most menus. Originally this recipe was prepared with bone-in chicken, and yet most restaurants particularly in the Western world prefer to serve it boneless. The beautiful caramel colour to the dish is vital. It is the combination of the fried onion, browned chicken and the addition of cream that gives this dish all of that and more. Using an assortment of butter's'; regular, clarified/ghee and a “nut” butter makes it simply divine. Cashews being abundantly available in India it is naturally their first choice to use these nuts liberally in many dishes. Optionally ready cashew butter can be used to complete it. Drain out the chicken from the marinade as best as you can and grill the pieces on a tray in the oven under the broiler. Alternately brown the chicken on both sides on the stove in a flat skillet. Grilling it on your bar-b-q is also another option. In a pan heat some butter or clarified butter and add the finely chopped large onion. Fry it until soft brown and the finely chopped garlic and green chillies. When fragrant add the remaining marinade and the pureed tomatoes. Bring to a boil and cook for 5 minutes. Add the cashew butter; you may need a bit extra to bind the sauce together until the right consistency is obtained. Now add the heavy cream and stir properly. Finally add the chicken pieces. Let it simmer until it is cooked through. Add on top a generous handful of freshly chopped cilantro or coriander leaves. Serve hot with warm naan. Adding a pinch of saffron can make it more fragrant. If you do not wish to grill the chicken cook it on a stove top in small batches in a large skillet, use high heat and let it brown on either side, to get the caramalised flavours. Use the broiler on a high for 5 minutes on each side if preferred. Brown butter and clarified butter may be prepared at home by simple boiling a nob of butter on a gentle heat until it separates. Continuing to cook it will create the sediments to turn brown. Hence leaving the clarified butter on top and the brown butter at the bottom. Preparing your own cashew butter is easy if you have a sharp coffee grinder. Put in half a cup of cashews and grind. It will turn into butter! Using the 'broken' cashews available in all stores will halve the cost as well. Crusty bread will also be quite delicious when warm and fresh. 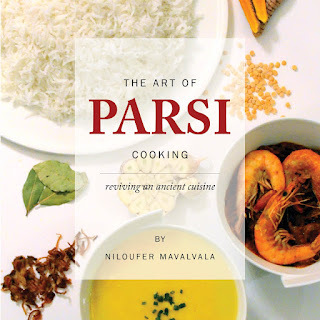 Read my cookbook The Art of Parsi Cooking; reviving an ancient cuisine to learn about Parsi Food and its history and origin.